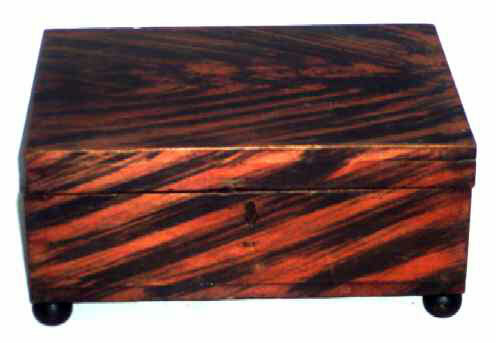 Punchy "Grain Painted" lidded box made of pine, circa, early 1800's. Exceptional and boldly painted with hand wrought nails, cut tin hinges, finely dovetailed construction and ball feet. Overall condition is excellent with a nice, dry original surface that shows very little wear. The finish is done with a thin black and red stain which is unusual but leaves a very attractive result. 11" x 7-3/4" x 5" high.